I thought iOS 7 has spoiled me to the point I don’t think I would need to jailbreak. I mean, there’re now Notification Center and Control Center which is a much better improvement (even though Control Center is not customizable). Turns out I was wrong. A few weeks with Cydia and I have found quite a few awesome apps/tweaks. Here’re some on the top of my must-have list. Have you ever beem waken up by your phone in the middle of the night and got blinded by how bright the screen was? Show your eyes some love and get this app. It’s awesome. 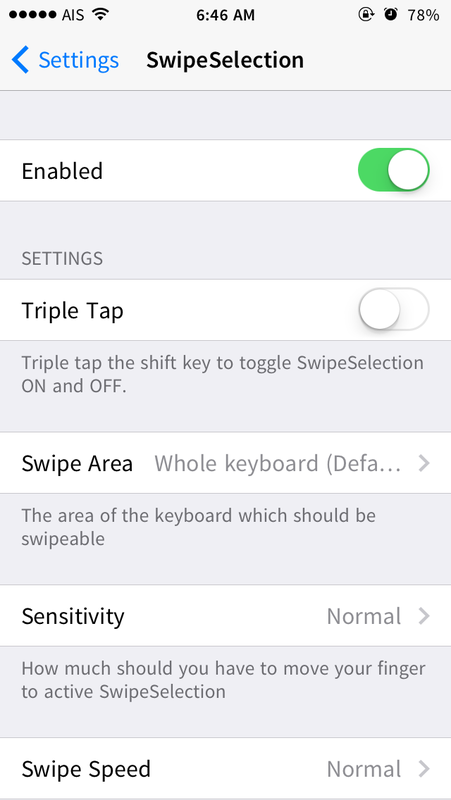 Text selection is so much easier with this tweak. There’s a Pro version that add several settings which you may like. If you don’t feel like paying, SwipeSelection is always free. Alternatively, there is SwipeShiftCaret (free) but you have to swipe on the text edit area instead of swiping on keyboard. This app allows users to change the font system-wide. I personally in love with Source Sans Pro font. Allows user to map many gestures for various different actions, toggles. Animations are cool (at first). After awhile, it’s more of annoying than cool. I use this app to reduce the delay to 0.6 (default 1.0. 0 is instant) and it feels much more responsive. I will add when i find more.